10 slices of all-butter shortcrust pastry filled with British chicken breast, ham and leeks in a rich and creamy sauce, topped with a lattice puff pastry lid. Chicken Breast (20%), Fortified British Wheat Flour (Wheat Flour, Calcium Carbonate, Iron, Niacin, Thiamin), Water, Leeks (10%), Ham (10%) (Pork, Salt, Water, Sugar, Stabilisers: Triphosphates; Preservatives: Sodium Nitrite; Antioxidant: Sodium Ascorbate), Onion, Single Cream (Cows' Milk) (6%), Butter (Cows' Milk), Cheddar Cheese (Cows' Milk), Pasteurised Free Range Egg Yolk (2.5%), Concentrated Butter (Cows' Milk), Rapeseed Oil, Medium Fat Hard Cheese (Cows' Milk), Brown Mustard Seed, White Wine Vinegar, Salt, Chicken, Yeast Extract, Cayenne Pepper, Chicken Fat, Cinnamon, Pimento, Sugar, Lemon Concentrate, Leek, Black Pepper, Sage. 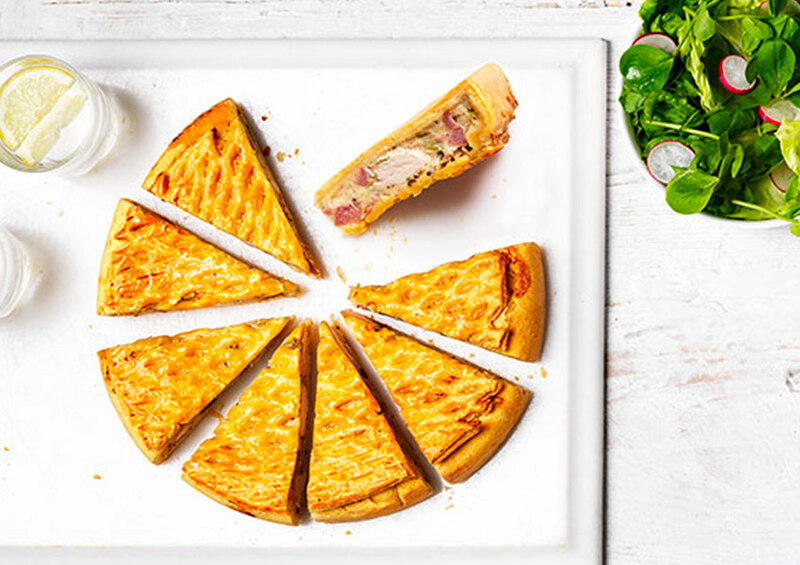 All Butter Shortcrust pastry filled with British chicken breast, ham and leeks in a rich and creamy sauce spiked with wholegrain mustard. Topped with a lattice puff pastry lid.